Hear ye, hear ye! Castles, thrones, knights, princesses, and crowns abound in this theme?s workshops, culinary activities, games, and crafts. 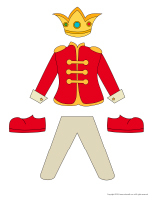 Decorations, posters, activity sheets, word flashcards, crafts, paper dolls, and many other documents fit for little kings and queens. 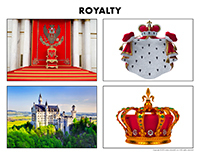 (Open thematic poster-Royalty) Print, laminate, and display all kinds of posters. 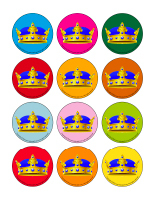 (Open educa-decorate-Royalty) Print, cut out, and laminate. Use the items to decorate the walls of your daycare and set the mood for the theme. (Open models-Royalty) Print. Let children decorate the garland. Cut it out and hang it within your daycare or near your daycare entrance. 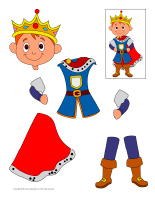 (Open educa-theme-Royalty) Print and laminate the items that represent the theme. Use them to present the theme to your group (and parents) while decorating your daycare. 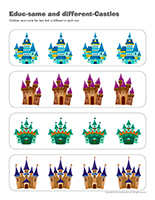 (Open stickers-Royalty) Print the illustrations on adhesive paper. Cut out the items and use the stickers to reward children. Set a chair in your daycare and drape red fabric over it to represent a throne. Set a long red rug in front of the chair. Hang tulle from the ceiling above the chair and add large vases filled with fresh or fabric flowers on either side of it. If you wish, you may also deposit large bowls or baskets filled with plastic fruit nearby. This special tool was created in response to a special request received. 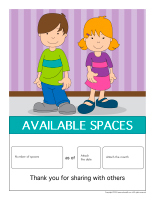 (Open Available child care spaces) Print, laminate, and use the labels to indicate the numbers of spaces available as well as the date when these spaces will be available. Throughout the week, children will enjoy pretending they are knights and princesses. Every morning, crown a king and a queen. Grant them privileges during the day (no naptime, don't have to help clean up, etc.). You will find a crown model in the arts & crafts section. You can also pretend you are a queen and welcome each knight and princess into your royal family as they arrive in the morning. Simply deposit a crown on each child's head and say, "Welcome Sir/Princess XXXXX." You may also hand each knight a cardboard sword if you wish. (Open picture game-Royalty) Print and laminate the pictures in the format you prefer. Use them to spark a conversation with your group and ask questions. (Open Poni discovers and presents-Royalty) Print the various pictures and cut them out. Use a Poni puppet or a puppet related to your theme to present the pictures to your group. (Open picture game-Royalty) Use the pictures to decorate your daycare or to spark a conversation with your group. Print, laminate, and store the pictures in a Ziploc bag or in your thematic bin. 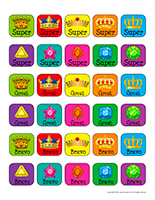 (Ope picture game-Royalty) Print the pictures twice and use them for a memory game. 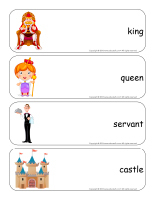 (Open writing activities-R like royalty) Print for each child or laminate for use with a dry-erase marker. (Open educa-nuudles-Royalty) Print for each child. Have children color the sheet. Once they are done, they may use Magic Nuudles to turn the coloring pages into three dimensional works of art. Variation: If you do not have Magic Nuudles, ask children to fill the spaces designed for Magic Nuudles with bingo markers or stickers. To order Magic Nuudles. (Open stationery-Royalty) Print. Use the stationery to communicate with parents, in your writing corner, or to identify your thematic bins. 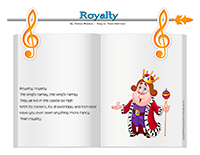 (Open activity sheets-Royalty) Print and follow instructions. (Open educa-spots-Castle) Print for each child. Use bingo markers to add color inside the spots. If you don't have bingo markers, simply ask children to fill the spots with dry cereal or stickers. (Open educ-shape tracing-Royalty) Print and laminate for durable, eco-friendly use. Children must trace the shapes using a dry-erase marker. Blocks children can use to build castles. Pictures of castles that can be displayed on walls to inspire children. Cone-shaped glasses, paper muffin cups, cardboard tubes, and other recycled materials that will encourage creativity. 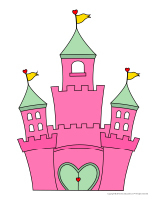 Decorate your craft area with castles to inspire children. Cardboard, tissue paper, empty egg cartons, recycled materials, and plenty of imagination for creating colourful castles. Pipe cleaners and tissue paper for making flags. Cardboard cones, tissue paper, and glitter or other accessories can be used to make princess hats. Cardboard masks and shiny silver paint for making king or queen masks. Poster paint for painting dragons, castles, princesses, knights, etc. Princess shoe models that can be decorated with paint and glitter. Heavy cardboard for making swords. Use the crown model available in the educatall club and let children decorate it with aluminum paper, pearls, beads, glitter, ribbon, etc. Heavy cardboard that can be used to make a shield or to represent armour. Empty cardboard tubes and cone-shaped paper glasses that can be used to represent castle towers. 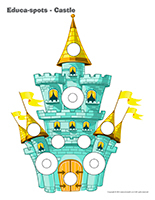 Simply glue a square piece of cardboard between two towers and you will have a castle that children will love to decorate and bring to life. Glitter, precious stones, and pearls that can be used to create jewellery fit for a princess: a brooch, a ring, a hairpiece, etc. 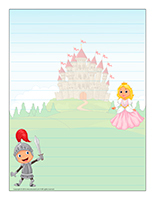 Castle, princess, knight, king, queen, or other coloring pages representing the Middle Ages. Gel crayons with dark paper. A large appliance box that can be transformed to represent a castle. You can leave the shape untouched or open it up and use it to delimit an area. Children will love decorating it! A chair with red and gold blankets to represent a royal throne. Jewellery and fancy dresses for princess costumes. Don't forget to provide crowns and high heeled shoes. Suits, scarves, fancy shoes, and hats for your little knights. Set your "beauty salon" in this area. Little princesses will love brushing their hair and applying pretend makeup. 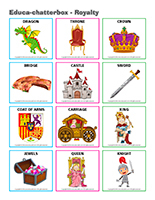 Memory game related to knights and princesses using educatall.com picture games or word flashcards. Modeling dough for sculpting princesses and knights. You may also add plastic soldier figurines. Children will have fun creating a variety of scenes. Necklace beads to create colourful necklaces. Different types of fabric (silk, fur, satin, etc.). Jewellery that can be touched, worn, and admired with magnifying glasses. A Lite-Brite game...its pieces shine like jewels. Books about castles, princesses, knights, the Middle Ages, etc. Book and CD sets related to the theme. Connect the dot activities involving castles. Hunt and seek games with royal scenes. Princess and knight illustrations where children must find the differences. An obstacle course where children must crawl around like a dragon or carry a plastic sword to free the princess. An obstacle course throughout which children must collect gold coins. Medieval Olympics involving a duel, a stone toss, village games, etc. Pin the tail on the dragon. Foam swords for duels between knights. Castle battle. Divide your group into two teams. Give each team the same number of crumpled balls of paper. Let them "attack" the other team for 3 minutes and then count to see which castle won the battle (the one with the fewest balls of paper in its territory). Organize a grand ball, invite children to dress up, and dance around with them. A sand table for building castles. A container filled with colourful marbles to represent gems. Magic sand recipe (See creative recipe section on educatall.com) for building castles that can be left out to dry and treasured for years. A large bin filled with hay and precious stones that children must find. With your group, prepare a salad that looks like a dragon's fire. Simply grate carrots and add raisins and mayonnaise or salad dressing. Use miniature and regular marshmallows to build a castle. You can deposit the marshmallows in a Ziploc bag with Jell-O powder to create colourful marshmallows. Simply shake the bag gently to coat the marshmallows. When they are done, children can eat their castle for a special treat. Prepare a royal feast. Set a decorated tablecloth on the table, deposit metallic confetti here and there, use plastic wine glasses, etc. Use the cards to spark a conversation with your group or in your reading and writing area. They may also be used to identify your thematic bins. 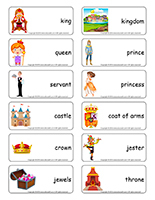 (Open word flashcards-Royalty) (Open giant word flashcards-Royalty) Print. Print and laminate the word flashcards. Each child picks a word and presents it to the group (ex. a crown). As a group, talk about each item. Ask children questions to encourage them to speak. 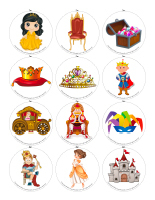 (Open educa-chatterbox-Royalty) Print and laminate the various illustrations. Decorate an empty shoebox or small bin as you wish. Fill it with tiny objects, pictures, illustrations, and accessories related to your theme, including the pictures suggested in the provided document. During circle time or when children are waiting for their lunch or snack, encourage them to take turns picking an item out of your box or bin. They can name the item and talk about it with their friends. (Open My kingdom scene) Print, laminate, and cut out. Children can use the various pieces to decorate the scene. This activity is a variation of the telephone game. Children sit in a circle. Tell them that you have a message for the king and you need their help to deliver it. Whisper your message in a child's ear. He/she must whisper it in the ear of the child who is sitting to his/her right and so on. The last child who receives the message must say it out loud. Verify the exactitude of the message, just for fun. 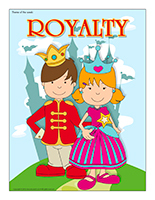 (Open story and memory game-Royalty) Print, laminate, and cut out the illustrations. Place them face down on the floor. Children take turns picking three cards and inventing a story in relation to the illustrations. Trick: Glue each illustration on the top of a frozen juice can to solidify them. (Open transition games-Royalty) Print each illustration twice. Use adhesive paper to stick one copy of each illustration on the table. Deposit the other copy of each illustration in a bag. Children can take turns picking an illustration to determine where they will sit at the table. You may also use the illustrations to determine each child's naptime spot or their place in the task train. 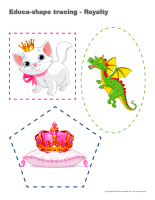 (Open transition games-Royalty) Print, laminate, and arrange the illustrations on the floor to create a path that leads to different areas within your daycare. The path can lead to areas children visit frequently such as the bathroom or the cloakroom. You may also use the illustrations to delimit your various workshops. Fill a large container with games and activities related to your theme. Children can use the items only once their hands are clean. Have children sit in a circle. Set a crown on one child's head. To the sound of music, children pass the crown around the circle, each setting the crown on his/her head momentarily before passing it to the child sitting to their right. When the music stops, encourage the child who is wearing the crown to pick a song that you will sing as a group. Continue as long as children show an interest in the activity. Select a child who will be the princess. This child must stand against the wall at one end of your daycare. The other children must stand with their back against the wall at the opposite end of the daycare. The princess turns around and taps the wall three times, saying, "1, 2, 3...princess!" Players then advance towards the princess as quickly as possible. However, as soon as the princess turns back around, they must stop in their tracks and remain perfectly still. If the princess sees a child move, the player must go back to the wall. The first child who reaches the princess becomes the princess (or knight) for the next round. Attach a rose (a plastic rose or a pink scarf) to a child's waist. Children move around the daycare. The goal of the game is to steal the rose. When a child succeeds, he/she must attach the rose to his/her waist and run off. The first child who successfully steals the rose three time is the winner. Provide several different decks of cards. Sit on the floor with the children in your group and have fun building houses and castles with the cards. Build a maze and include a variety of obstacles such as a rope hung between two chairs that children must jump over, a bucket filled with water set on a chair that children must crawl under, etc. Incorporate whatever you have on hand. For example, you can have children wear an elf hat. Maximize the different ways children are to move about (run, hop, spin around, etc.). 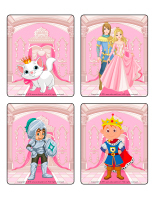 Select a child who will be "it" and play the role of the prince or king. He/she must try to touch the other children. Once a child has been touched, he/she must remain perfectly still, with his/her arms stretched out. The other children can free those who have been touched by running under their arms. Draw a large square on the floor with colourful adhesive tape. Invite two children to stand inside the square. Give them each a foam noodle (for swimming pools) that will represent their sword. 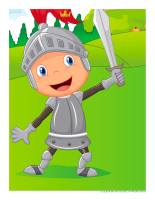 Encourage children to tap their adversary's "sword". Give clear instructions and supervise this activity closely. (Open dragon wings) Print a pair or wings for each child. Encourage children to color and decorate them as they wish. Attach a Popsicle stick behind each wing. Create an obstacle course that includes a balance beam, hula hoops, colourful adhesive tape lines that children must walk on or jump over, etc. Children pretend they are dragons and complete the obstacle course as if they were flying through it. Draw a large square on the ground with colourful adhesive tape. Invite two children to stand inside the square. Give them each a foam noodle (for swimming pools) that will represent their sword. Encourage children to tap their adversary's "sword". Give clear instructions and supervise this activity closely. The first child who drops his "sword" loses the combat. Divide your group into two teams: the dragons and the knights. The knights must protect the queen. The dragons stand side by side on a line and the knights stand on another line, a few feet away. The dragons must turn around and face away from the knights. During this time, the knights slowly advance towards the dragons. The early childhood educator shouts out, "Watch out for the knights!" The dragons quickly spin around and run away to avoid being captured by the knights. (Open dragon's tail) Print and assemble the dragon on a wall. 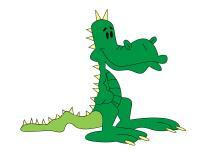 Invite parents to join you for a game of "Pin the tail on the dragon" at the end of the day. Blindfold them as they take turns attempting to pin the tail as close to the right place as possible. Children stand in a circle. Have one child exit the room. Before he/she returns, designate a child who will be the orchestra conductor. Children shall pretend to play the violin, the flute, the piano, drums, a guitar, etc. When the child returns, he/she must guess who the orchestra conductor is. (Open giant hunt and seek-Royalty) Print and laminate. Children pick a card and search for the item in the scene. 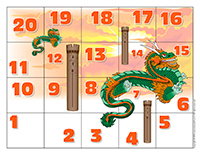 (Open snakes and ladders-Dragons) Print and laminate. Use a die and tiny dragon (or dinosaur) figurines as playing pieces. The goal of the game is for each child to reach the last square on the board game. 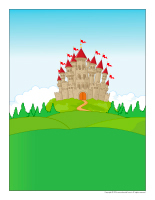 (Open educ-same and different-Castles) Print and laminate for durable, eco-friendly use. Children must circle the illustration that is different in each row. 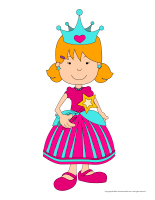 (Open dress-up dolls-Royalty) Print and laminate. Leave the items out for children to manipulate. They will enjoy using them to dress the doll. Wrap girls in lace curtains or luxurious fabric. Provide necklaces and other jewellery. Use makeup pencils to draw stars on their cheeks and add glitter. Finally, set a crown on each child's head. For each child, cut a black garbage bag so that it is open on either side to represent a cape. Tie a knot so boys can wear their cape. Set a crown on each child's head. Fill a container with several plastic gems. Set a variety of magnifying glasses nearby. Children will love using the magnifying glasses to observe the gems up close. Fill a container with tinted rice (or use another sensory bin). Hide jewellery among the grains of rice and encourage children to search for them. Use regular and miniature marshmallows to build a medieval castle with the children in your group. Use toothpicks to hold the marshmallows together. Dip a few marshmallows in melted chocolate to add extra details. You may also purchase edible color markers to draw on the marshmallows. Bake a cake in a square pan. When it is ready, cut it in half. Cut one of these two sections twice diagonally to create triangles. Arrange them over the other rectangle and spread icing over your crown-shaped cake. Add shiny candy pieces and decorations. Prepare shortbread cookies. Use a round cookie cutter to represent gold nuggets. Sprinkle gold decorative sugar on each cookie. 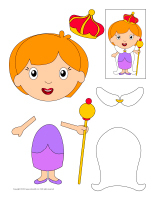 (Open King's and queen's crown) Print the model and trace it on heavy cardboard for each child. Cut it out and wrap it in aluminum foil. Decorate the crown with shiny items. Measure each child's head and staple his/her crown so it fits snugly. You will need heavy cardboard (from boxes). 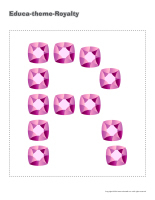 Cut a diamond shape for each child and invite children to paint their shield. Use adhesive tape to attach a handle behind each child's shield. (Open princess headpiece) Print for each child. Help children wrap their headpiece in aluminum foil. Staple it so it fits snugly on their head and let them decorate it as they wish. Depending on the size of each child's head, use one or two pipe cleaners to form a circle. Use additional pipe cleaners to form half-circles around this initial circle to create a crown. 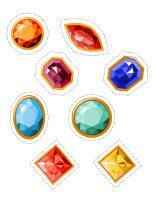 Provide shiny stars and gems that can be used to decorate the crowns. (Open jewel models) Print. Cut a 2 cm strip of construction paper for each child. Use glue to stick jewels on the strip of paper, alternating colors. (Open craft-masked ball) Print. Provide a variety of materials children can use to decorate their mask: feathers, felt, glitter glue, glitter, etc. Tie a piece of string on either side of each child's mask so you can tie it behind their head. (Open sword) Print the model on heavy cardboard and cut it out. Children can paint or decorate their sword as they wish. Arrange rubber bands with different widths around a Styrofoam meat or vegetable tray. Children will have fun playing their harp. (Open gold pieces) Print. Add gold glitter to yellow paint or use gold poster paint. Cut out the models and let children paint them. Once dry, children can use them for treasure hunts and other activities. (Open models-Royalty) Print as many copies as you need. Use the models for crafts and activities throughout the theme. (Open puppets-Royalty) Print the models on heavy cardboard. Have children cut them out and decorate them with a variety of materials. Stick a Popsicle stick behind each one. (Open my little king) Print, cut out, and color. Use the pieces to transform an empty toilet paper roll and make it look like a king. Simply glue the items on the cardboard tube and hang the character from the ceiling. (Open my little queen) Print, cut out, and color. Use the pieces to transform an empty toilet paper roll and make it look like a queen. Simply glue the items on the cardboard tube and hang the character from the ceiling. (Open mandalas-Royalty) Print for each child. Invite children to color the mandalas to help them calm down and relax during the day. (Open finger puppets-Royalty) Print the models on heavy paper. Ask children to cut them out and decorate them with various materials. Show them how they can insert their fingers in the holes to make the puppets move. 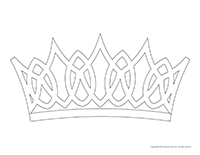 (Open coloring pages theme-Royalty) Print for each child.